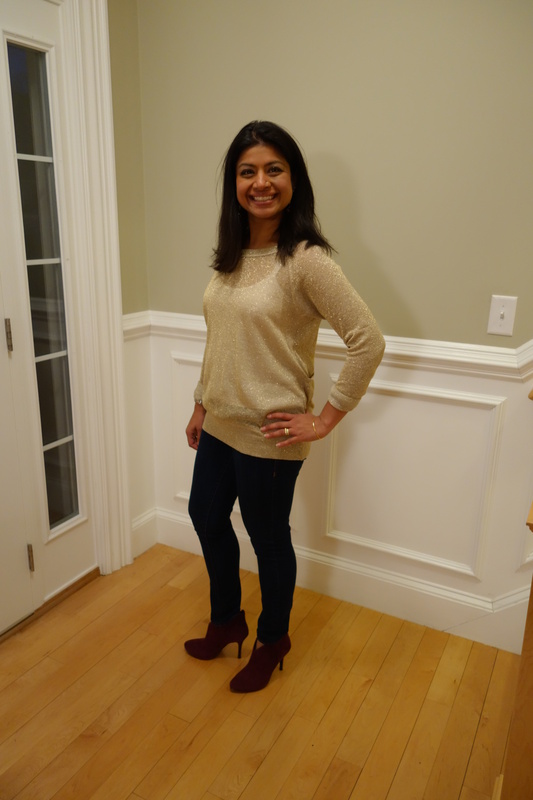 Yes, boot season is over but (see prior blog post from earlier today) I never got around to blogging about my week in black boots this past March. It was quite an achievement given how long and hard I had looked for even a single pair of black boots that wouldn’t cause leg ischemia and rip at the seems around my calf. So I figured I would share as it might be useful for next boot season at the very least. 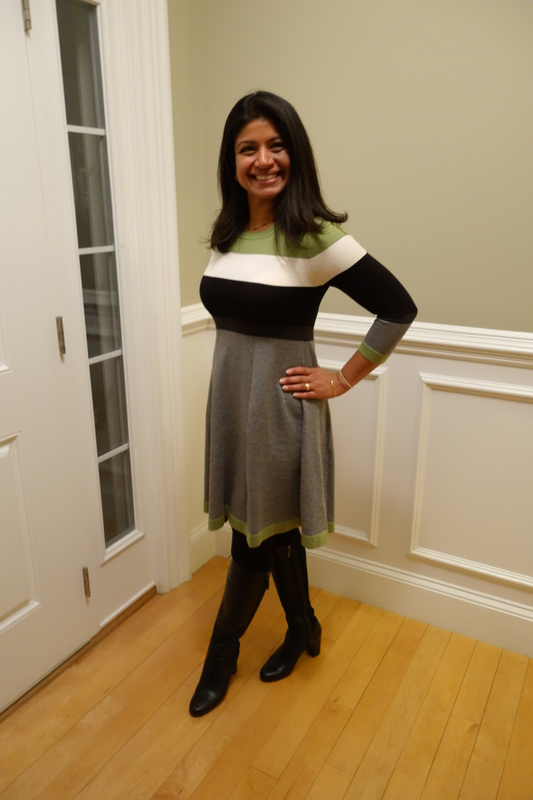 Tuesday: My new Eliza J sweater dress (first time ever a sweater dress did not make me look ever so slighter pregnant) and my Aquitalia square heeled boots. I have found that almost all boots from this brand fit my calves and the waterproof leather gives me a ton of leeway to wear them that I do not have with the Monday boots (which I carried to and from work in their red bag to protect them from the ravages of winter on my local streets and parking lots). 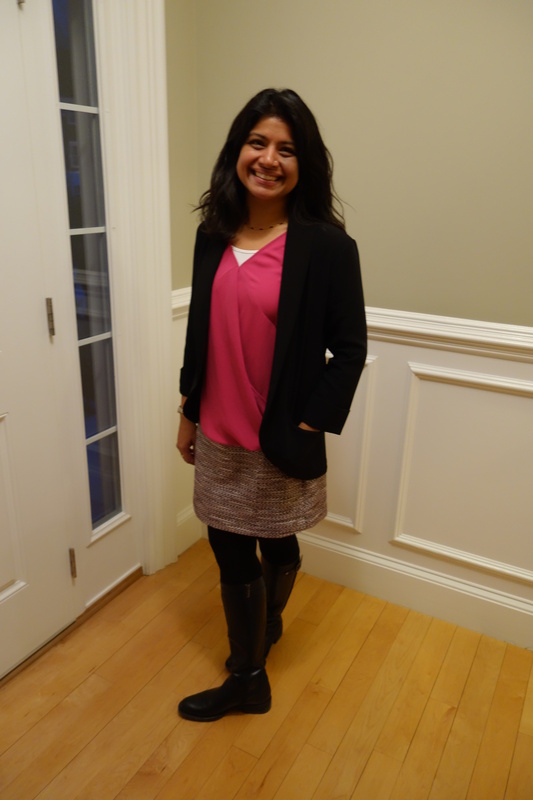 Wednesday: A skirt, blouse, and blazer combination curated from Nordstrom Rack with an Adea top and my Aquitalia riding boots acquired from Hautelook. I liked them so much I bought the brown ones as well. The calves are fine but the feet are narrow and so, for the first time ever, I own a pair of shoe trees to try to rectify the problem. 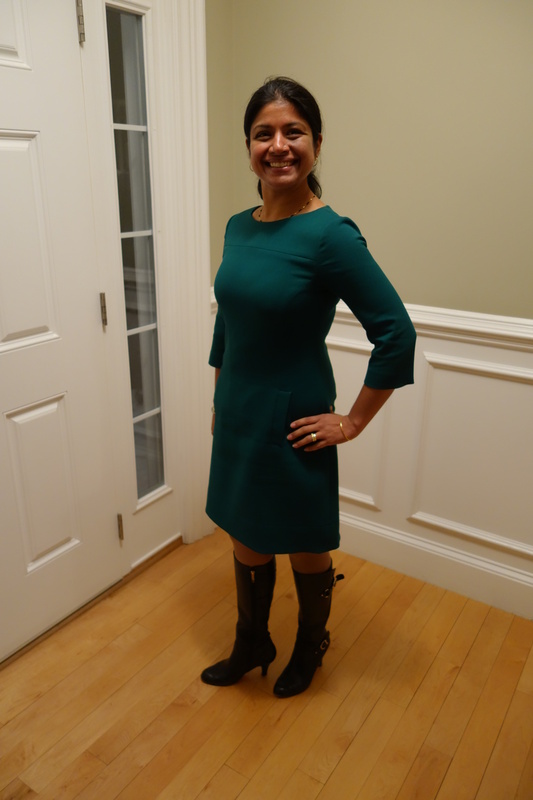 Thursday: It was St. Patrick’s Day and I wore my favorite green dress (also from Eliza J) with my Anyi Lu dress boots. The dancer footbed is indeed a dream and the 2.5in heel totally manageable on a busy work day. Friday: We had a work retreat and I felt the need to go totally casual. I am obsessed with this Max Studio (also from Nordstrom Rack) dress that is easily the most comfortable thing I own. I could live in it. I paired it with my Stuart Weitzman riding boots which after a few years of wear sag a bit too much at the ankles but worked with casual. 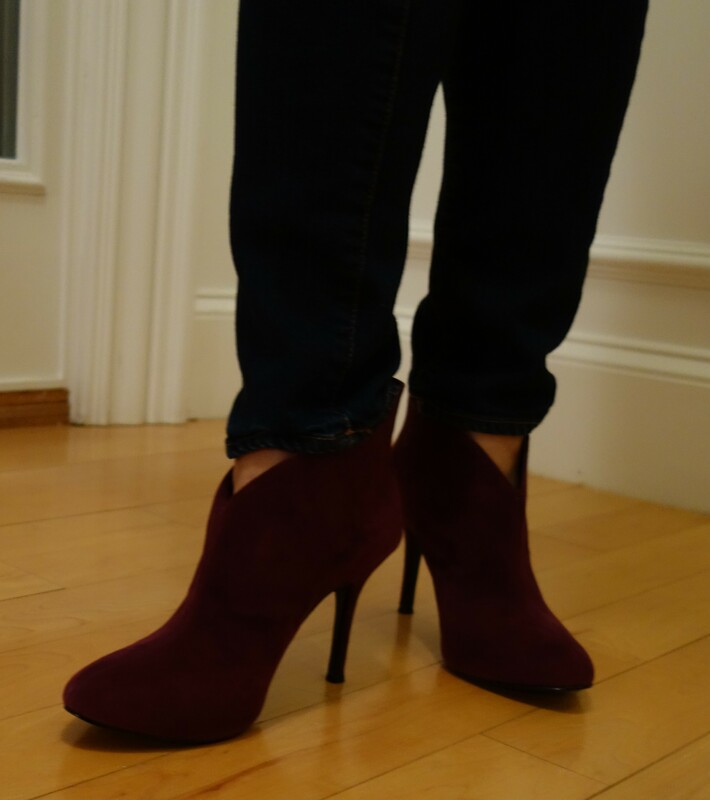 Finally, the week ended for me (well not really since I was on call the following Saturday starting at 6am) with a casual work function so I broke out of both the black and the tall boot and instead went for these Vince Camuto aubergine suede booties paired with William Rast jeans and a woven gold top (a Nordstrom brand that escapes me at the moment) that I acquired for my 20th high school reunion a while back and still love to wear 3 year later since for me investing in a gold article of clothing is like basic black for everyone else. 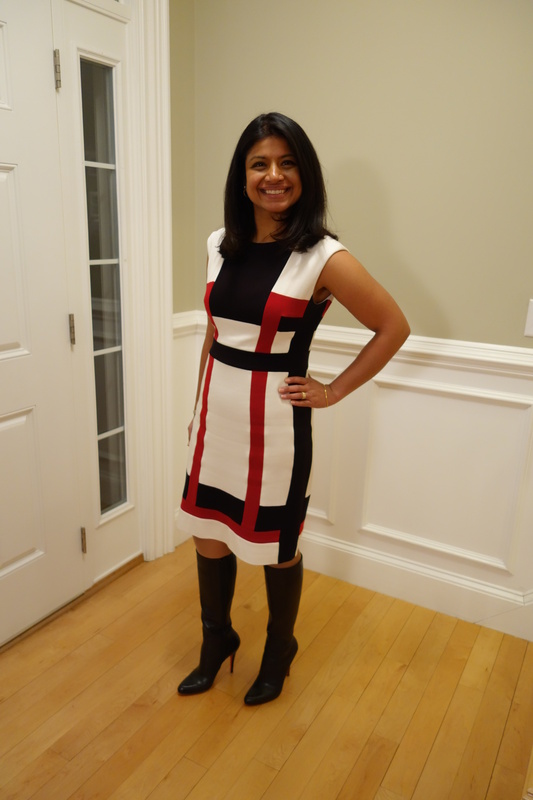 This entry was posted in Clothing, Fashion, Shoes and tagged Anyi Lu, Aquitalia, black boots, Christian Louboutin, Eliza J., Hautelook, Max Studio, MyAdea, Nordstrom Rack, Stuart Weitzman, sweater dress, waterproof boots by surgeoninheels. Bookmark the permalink. Okay wait. Heeled boots at work? Teach me your secrets! Office days are different than clinical days. I were only danskos on clinical. All but the Louboutins (too high) and Aquitalia riding boots (too tight in forefoot) are fine for a 10,000k day to and fro. Anyi Lu is incredibly comfortable. 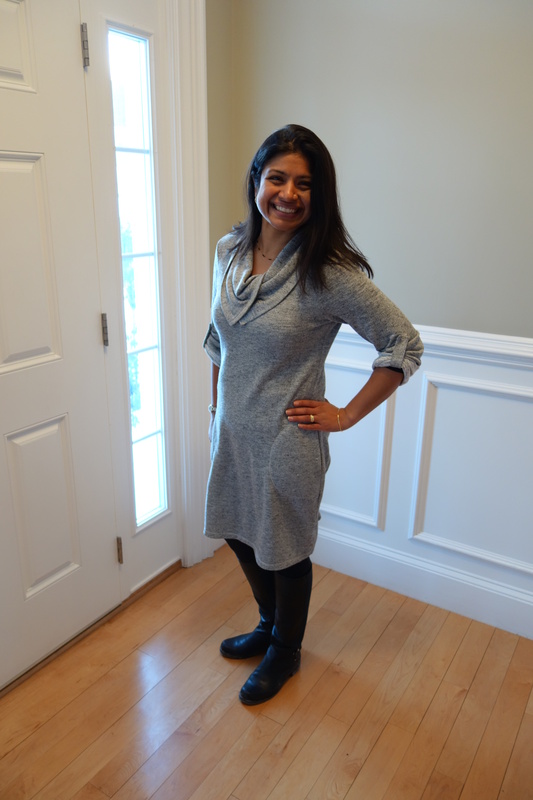 The stacked heel of the other Aquitalia boots poses no challenge. So I often travel in one of these two to transition from suits to skinny jeans etc. The SW riders are just blah–kind of worn and worn enough to be comfy. Ooh, love that green dress! Thanks. It’s one of my favorites and rather timeless.